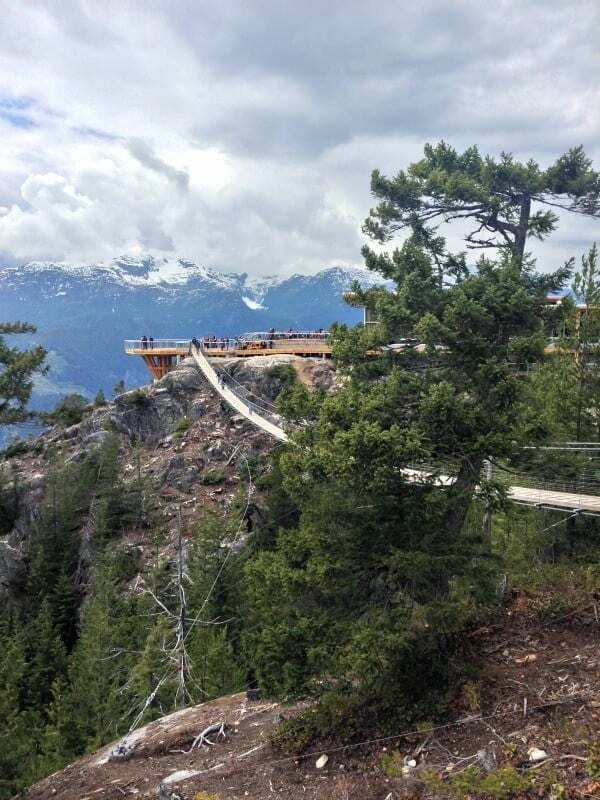 The newest attraction along the beautiful Sea to Sky highway between Vancouver and Whistler puts Squamish firmly on the map as a must-stop destination. 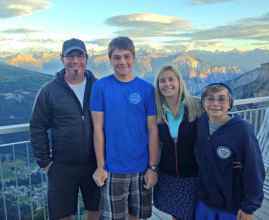 The Sky to Sky Gondola opened in May, and has immediately become a hit with locals, day-trippers and tourists. Located just 45-minutes from Vancouver, the Gondola has opened up a whole new area around the climbing mecca of the Stawamus Chief, by allowing those of us who can’t (or won’t) rock-climb the granite cliff face, or hike up from the base, to ride up in ease and style on a 10-minute, 885 metre trip to Summit Lodge. From the Lodge, hikers and visitors are treated to simply stunning views of Howe Sound fjord, the Chief, and the Garibaldi Mountain range. There is a wide variety of activities, sights to see, and spots to just rest and enjoy a cold beer and snack on a hot summer day. The Sky Pilot Suspension Bridge is only 100 metres long. You can do it! 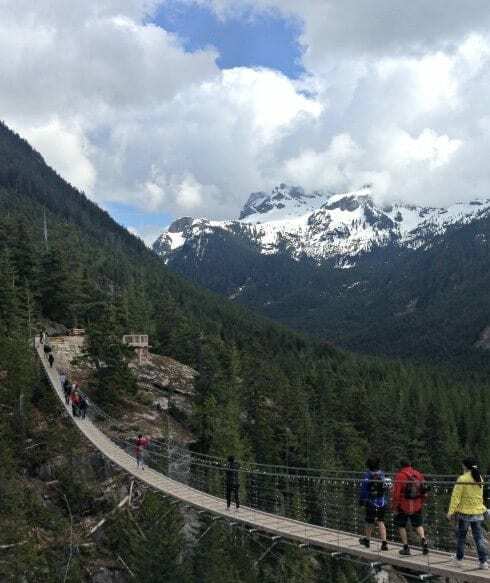 I can be a bit squeamish on suspension bridges, but we had no problems walking across the Sky Pilot Suspension Bridge. 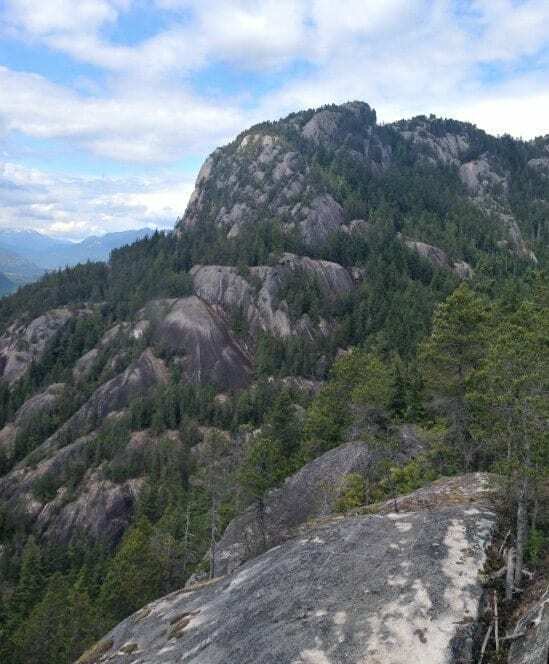 The drop below isn’t that steep (comforting), and the views are worth the walk, with a 360 degree panorama of the mountains and Howe Sound fjord. The Bridge is accessible from the Lodge and its impressive Viewing Deck, so you can take advantage of multiple and amazing views and angles at any time of day. There are six main hiking trails from Summit Lodge, as well as backcountry trails accessible from the area. The trails range in ability and difficulty, so there is something for everyone. Free guided tours from Summit Lodge are available daily at 11 AM and 2 PM. If you’re up for more adventure, you can choose to hike the Sea to Summit Trail. This trail begins at the base of the mountain at Shannon Falls, and climbs just over 9 kms to the Chief. Hiking time is estimated at 3-4 hours. Bonus: you can relax on the way down and take the Gondola for only $10. There are two built walking trails that are easily accessible from Summit Lodge. Both the Panorama and the Spirit walking trails are graded and stroller friendly, offering incredible lookout viewing platforms to enjoy the view and snap some great nature photos. The Panorama Trail is a 1.6 km loop that includes several viewing points, including the dramatic Chief Overlook Viewing Platform, cantilevered over hundreds of meters of drop. The 400 m Spirit Trail highlights the rich history of the Squamish First Nations, with interpretive displays and views from the Spirit Trail Viewing Platform. The Summit Lodge is a perfect spot to stop and appreciate the views, enjoy a meal, or a beer and snack after a day of adventure. 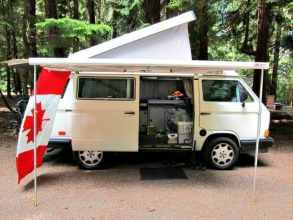 There is a self-service restaurant and a bar (with table service on weekends), as well as a Tea House with pre-packaged snacks, a Retail Shop, and plenty of washroom facilities. You can choose to eat in or enjoy the view from the patio and viewing deck. The Sea to Sky Gondola sells a Download Only “Buster the Dog” Pass. This season pass is $25 ($15 of which goes to the Squamish SPCA). Hikers taking the Sea to Summit Trail with their pooch can pre-purchase the dog pass, then download with their on-leash dog on a specified gondola cabin. This policy is in recognition that many locals love to hike with their furried friends, and will certainly be popular as it benefits local charity to boot. Gondola Ride: 10 minutes, 885 metres from base to Summit Lodge. 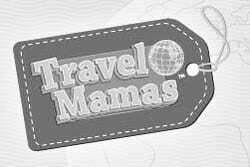 Tickets: Family Season Pass: $249 + GST. Family Day Ticket: $89.95 +GST; Adult: $34.95, Youth: $22.95, Child: $13.95. 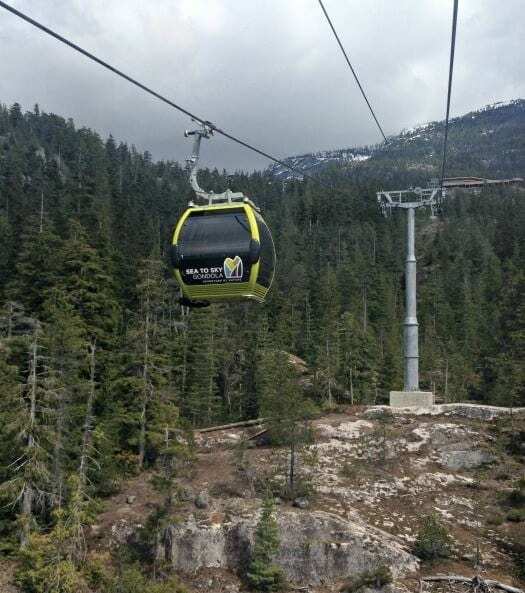 App: You can download the free Sea to Sky Gondola App on your iPhone to keep up-to-date on events, trail maps, and weather. Credits: All photos by C. Laroye. Disclosure: The writer thanks Sea to Sky Gondola for the opportunity to visit this new attraction. As always, our opinions are honest and our own. 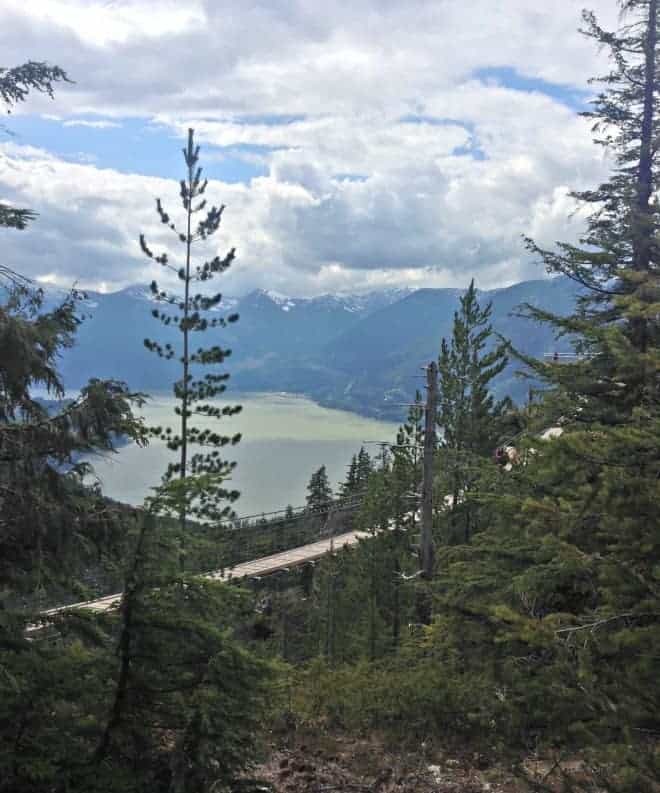 Have you visited the Sea to Sky Gondola? Share your experience in the comments. Wow! So fun! That’s my favorite place to go white water rafting! I’ll have to make a trip back to see the Gondola!!! Yes you’ll have to visit and take a ride in the gondola Shana!